A Call of Duty: WWII player says he found a glitched menu in the game’s beta with images that appear to show a modified version of the Uplink game mode, meaning that Sledgehammer could be working to keep its “jetpack basketball” mode alive even when the game is set in the early 1940s. WWII is set to arrive on November 3, and players were able to get hands-on with the PC beta over the weekend. Reddit user ‘trevormine’ posted screenshots for a ‘Gridiron’ mode supposedly found within the beta, which show red and blue portals similar to the ones found floating on the maps in the Uplink game mode. Sledgehammer Games originally introduced Uplink in Call of Duty: Advanced Warfare, setting a more hectic pace for competitive gameplay. 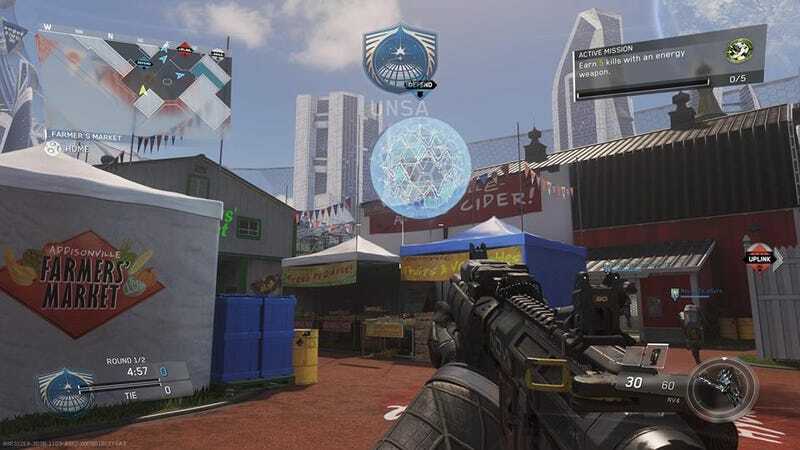 Uplink is a fast-paced mode that feels like a futuristic game of basketball in Call of Duty fashion: Players are meant to boost around the map in a fight for a ball-shaped drone, passing and moving the ball to a portal on the opposing team’s side of the map. The version of the mode in Advanced Warfare was great for casual players, but it also became a fresh addition to the pro scene. Originally introduced into the Call of Duty Pro League with three returning competitive modes (Capture the Flag, Search and Destroy, and Hardpoint) Uplink proved a smart addition to the set. In fact, Uplink eventually edged out Capture the Flag completely for Major League Gaming’s Pro League Season 3 for Advanced Warfare. Search and Destroy has long been a staple of competitive Call of Duty, but has often taken criticism from fans for being too slow and boring to watch, while Capture the Flag can either feel intensely competitive or fall to a boring stalemate. I personally love Capture the Flag, but I understood the decision to replace the classic mode with Uplink. Sledgehammer created a mode that’s really entertaining and more consistent with pace, feeling right at home with the chaotic advanced movement. Last minute throws or dunks for game-winning points is often what draws spectators to Uplink. There’s nothing like watching a member of your favorite team boost up to score a game-winning dunk with just seconds to spare! Now, after three years of Uplink in the “advanced movement” era of Call of Duty, some voiced concerns that the pace would feel too slow for competition as the franchise transitioned back to classic “boots-on-the-ground” gameplay. There hasn’t been any confirmation from Activision or Sledgehammer, but if these screenshots are real, it appears some variation of Uplink will likely live on in WWII.